Head of a Catalan Peasant is one of Joan Miró's most important works of the mid-1920s. It fuses the explicitly Catalan imagery, which had characterised much of his work between 1923-4, with the 'automatic' style he had developed in Paris, under the influence of the Surrealist group. Miró began the work by painting his canvas with a white ground. He then applied a very thin, almost translucent wash of blue oil paint mixed with turpentine. This created an airy space which contrasts with the graphic quality of the semi-figurative imagery. The composition was long believed to have been drawn in a dreamlike state, as if spontaneously from Miró's unconscious. This myth was endorsed by Miró himself, who described how, 'in 1925, I was drawing almost entirely from hallucinations'. However, the grid-like structure under the blue wash suggests that Miró mapped the composition with the same meticulous care he used for such earlier works as Catalan Landscape (Museum of Modern Art, New York). A tiny preparatory drawing relating directly to Head of a Catalan Peasant has been identified, which includes a grid similar to that visible in the final painting, thus confirming a degree of pre-meditation. The sketch has been torn out and stuck into the so-called 'Montroig sketchbook'. However, its date, 10 March 1924, suggests it was made before Miró left Paris to spend the summer at Montroig in Catalonia. The image of the Catalan peasant first appears in Miró's work in The Hunter, 1924 (Museum of Modern Art, New York). Miró stated that this work was inspired by the sight of a Catalan peasant out hunting, wearing his distinctive 'barretina' cap. This cap was regarded as a symbol of nationalism, and was probably included as a response to the Spanish government's suppression of Catalan nationalism and specifically the Catalan language at the time. 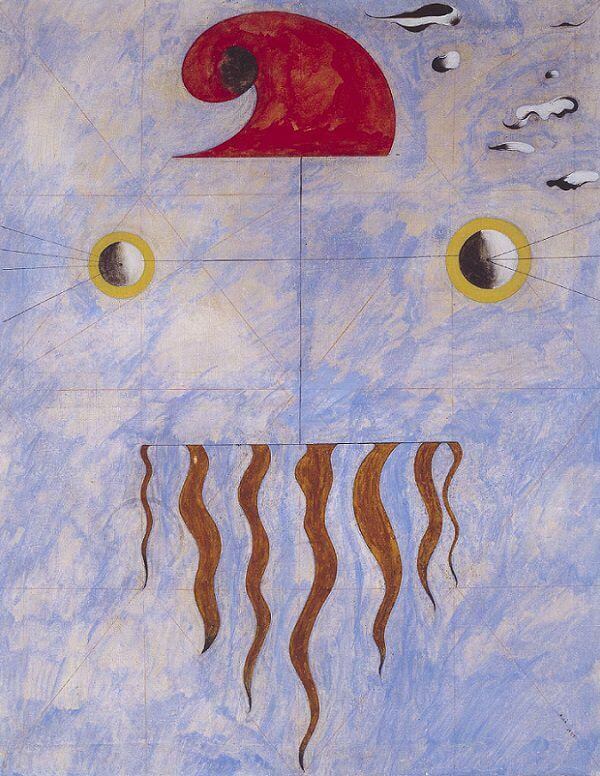 The other elements in the composition are more ambiguous: shapes which suggest two eyes and a beard might also be interpreted as two breasts and an area of pubic hair, generating a characteristically Surrealist element of sexual ambiguity. The wisps of hair also suggest roots, implying an intimacy between the peasant and the soil he works. In the upper left hand corner of the painting biomorphic forms appear to float freely in the pictorial space: these do not appear in the preparatory sketch.